Stacey is a multi-disciplinary artist working in a variety of media. Current projects focus on symbols, dream states, mythological themes and the meditative traditions of color and form using paint, collage and music. Through her two decades in the music industry (working in recording studios, record labels and the Musician's Union), she developed an interest in coaching creative people through the pitfalls and roadblocks they face. 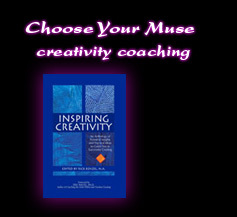 In 2003, her essay on creativity was published in the anthology “Inspiring Creativity “ (c2005 Creativity Coaching Association Press). Stacey works with a varied clientele-- coaching individuals, facilitating staff retreats and leading group workshops. The “Choose Your Muse” Workshops are a series of multi-disciplinary play dates using the ancient Greek Muses of Inspiration as a framework for exploring creativity. The workshops include theater games, writing exercises, and painting activities. The Workshops create an environment where participants have permission to let loose and have fun – No special skills or experience are necessary, just a willingness to play! Stacey is available to speak on a variety of creative topics tailored to reflect the need and mission of the organization involved.